It’s almost four years since Samsung Galaxy Note 4 came to the smartphone market. This robust, big and plastic body smartphone isn't the newest kid in the block anymore. However, Galaxy Note 4 has a lot to offer to those interested in buying a budget-friendly smartphone. Some would say the phone is outdated, and it won't be able to catch on, but Samsung is still selling the device that proves. Note 4 isn't that old. The smartphone comprises convincing hardware support and delicate design. Note 4 was launched with a 16MP camera, powerful chipset and a vibrant display. However, Samsung has launched two more updates after Galaxy Note 4 that includes Note 5 and Note 7. The Note 7 was a total disaster for the company, Samsung had to recall all the sold units and asked the consumer not to buy Note 7. Samsung Galaxy Note 4 is a way better performer than its successors, and more importantly, it never blasts like Note 7. Let’s unbox the old smartphone to know what it has to offer. Talking about the design, the Galaxy Note 4 still looks good in its plastic body that was the latest trend back then. Samsung didn't make any changes in the size of the phone it carries a 5.7-inch shell similar to Galaxy Note 3. However, the display and the design receives considerable upgrades. The plastic body of the phone lies on a rigid metal ring that surrounds the phone’s chassis. The body comes with the rounded corners that will remind you of Samsung Galaxy Alpha. The Note 4 is the wider smartphone to operate in one hand, but the plastic body provides a better grip for operating it single-handedly. The smartphone measures 153.5 x 78.6 x 8.5mm which clearly shows that it is exactly same as its predecessor. The lock/power key is placed at the right side which is very easy to reach. You can notice that in spite of being a wider smartphone the Galaxy Note 4 is easy to operate with one hand. However, even metal body iPhone 6 and 6 Plus aren't quite good with a single hand with their smaller width. At the bottom of the phone, you will find the traditional home button from Samsung that is integrated with the fingerprint sensor. On flipping the phone, you will see a 16MP camera accompanied by a flashlight and a heart rate monitor. Whether you believe it or not Samsung Galaxy Note 4 was one of the surprising smartphone launched back then. It came with a 5.7-inch big display that makes it among the few phones to possess such big screen. Samsung has embedded Super AMOLED capacitive touchscreen in the smartphone. The display of the phone boasts 1440 x 2560 pixels resolution that made it join the handful of smartphones offering QHD experience. In addition to this, the smartphone comes with 16:9 aspect ratio to attain 73.4% screen to body ratio. The display of the phone is protected by Corning Gorilla Glass 4. Talking about the internal power of the phone it runs on Qualcomm APQ8084 Snapdragon 805 Exynos 5433 chipset which is quite powerful. The chipset of the phone is supported by Octa-core (4x1.3 GHz Cortex-A53 & 4x1.9 GHz Cortex-A57) processor. The processing unit of the phone is fast compared to the other devices launched at that time. Galaxy Note 4 uses the 3GB RAM and 32GB internal storage to perform the operations. Samsung Galaxy Note 4 was launched with a 16MP rear camera that is made up of a lens having a f/2.2 aperture. The camera comes with Geo-tagging, touch focus, face/smile detection, panorama, HDR and all other essential camera features. The front camera of the phone is composed of a 3.7MP lens. Galaxy Note 4 was launched with Android 4.4.4 (KitKat) as its operating system that is upgradable up to Android 6.1 (Marshmallow). The storage of the phone is expandable up to 256GB using a microSD card that uses a dedicated slot. Apart from the premium looks and high-end specs Galaxy Note 4 also inherited some other features of 2014 flagship smartphones. Note 4 comes with heart rate sensor that lies at the back of the phone. However, it put you through a little struggle to place your finger on the right spot without seeing it. The good news is that the sensor works well and gives pretty accurate readings. The other best thing is that the heart rate sensor allows you to save the results so you can come back and view your history anytime. In addition to this Note 4 also tells you the stress level by reading your heart rates. However, it is unclear that how much the stress level is scientifically accurate. Galaxy Note 4 also comes with an inbuilt pedometer that will tell your total step counts. You will also be able to keep track of your diet, fitness, and exercise using the Samsung’s health app. Samsung has done a great job on Galaxy Note 4 by embedding the powerful hardware support into a well-designed smartphone. However, the phone isn't the latest phablet from the company but if you are looking to upgrade your older device and won't have enough budget for Note 5 then Note 4 isn’t a bad choice. 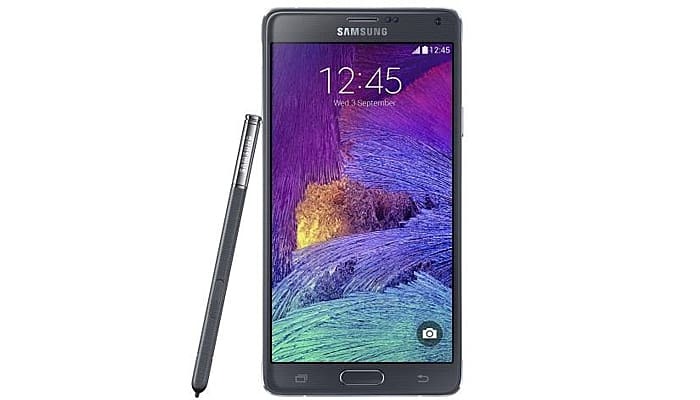 Samsung Galaxy Note 4 is reasonable and affordable phablet that comes with a big screen having AMOLED display in it. So, you will be getting a good deal considering the price.